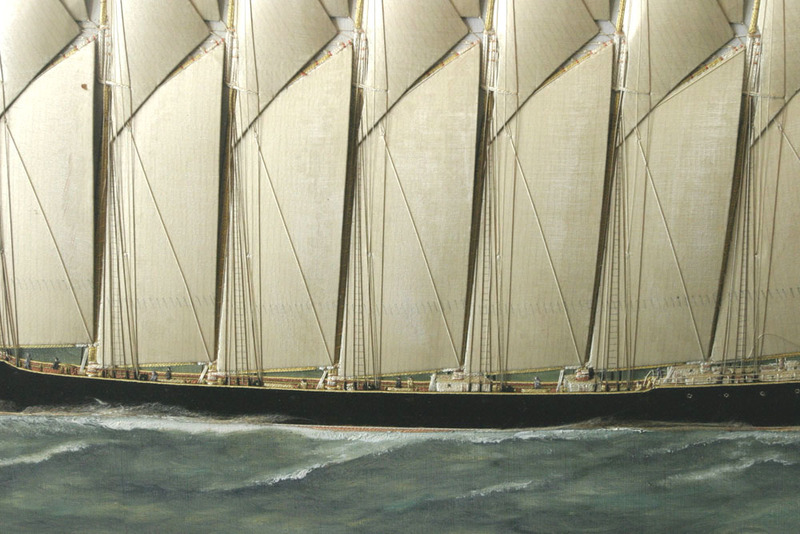 Black-hulled and spreading the most canvas of any schooner ever, nearly an acre at 43,000 square feet of sail, the THOMAS W. LAWSON was the only seven-masted schooner ever constructed; built by the Fore River Ship & Engine Building Company of Quincy, Mass.. While a impressive presence for the Coastwise Transportation Company of Boston. Mass., the designer, noted marine architect B.B. 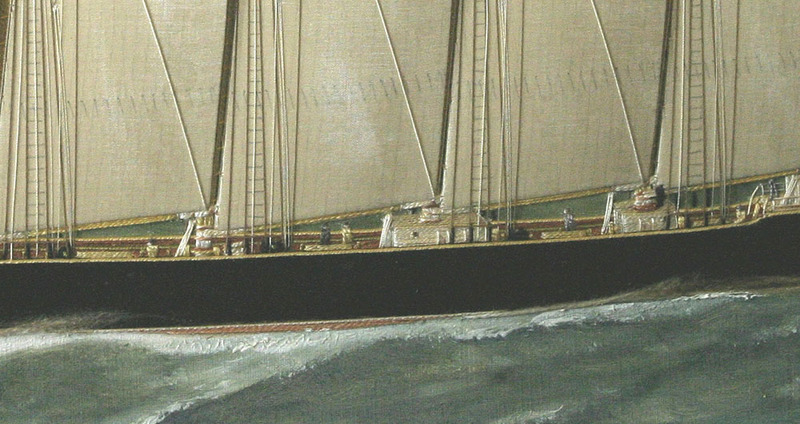 Crowningshield of Boston, later admitted that her length-to-breadth ratio at 360'-to-50' was out of keeping with her rig, especially since she was steel and not wood. Her three desks running her entire length, accessed through six cargo hatches, allowed for a massive 7500-ton capacity. 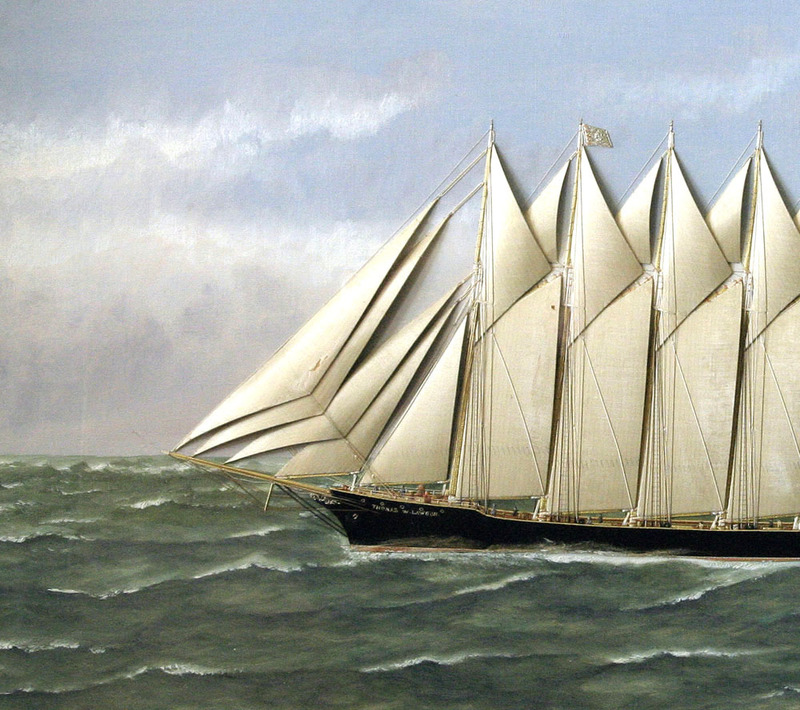 Willis presents the schooner in a crisp port broadside with all sails up. 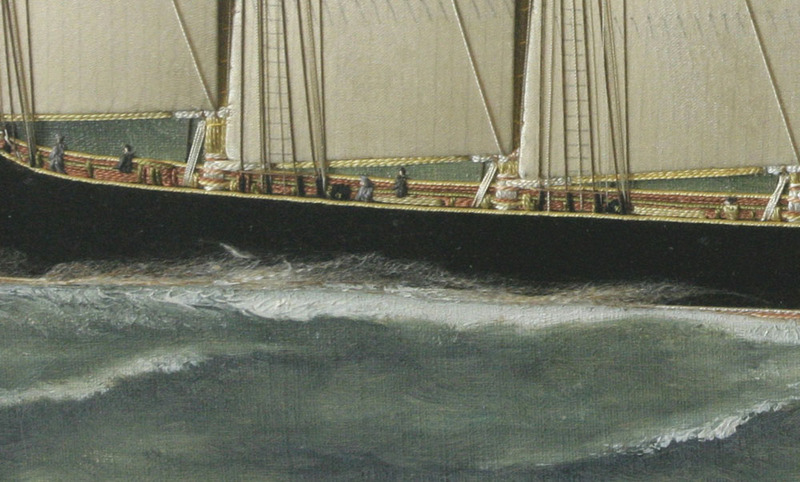 Part of the ships lore focused on what to call her masts; the most widely accepted version has them as: fore, main, mizzen, pusher, driver, jigger, and spanker. Her crew called them whimsically after the days of the week. She required only a 15-man crew plus a captain, since much of her rig was activated with steam-driven hoists and she had a electric generator onboard for other instruments and lighting. 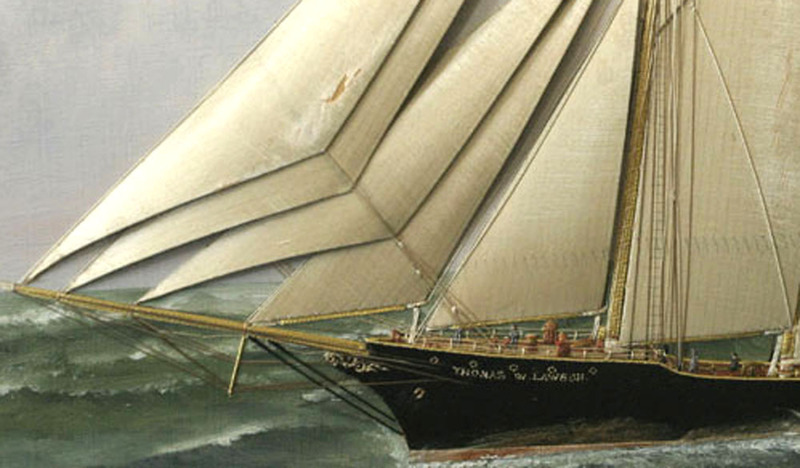 Atop the masts where Willis has luffed silk sails are a commercial houseflag, a government pennant and the American Merchant Naval Ensign. 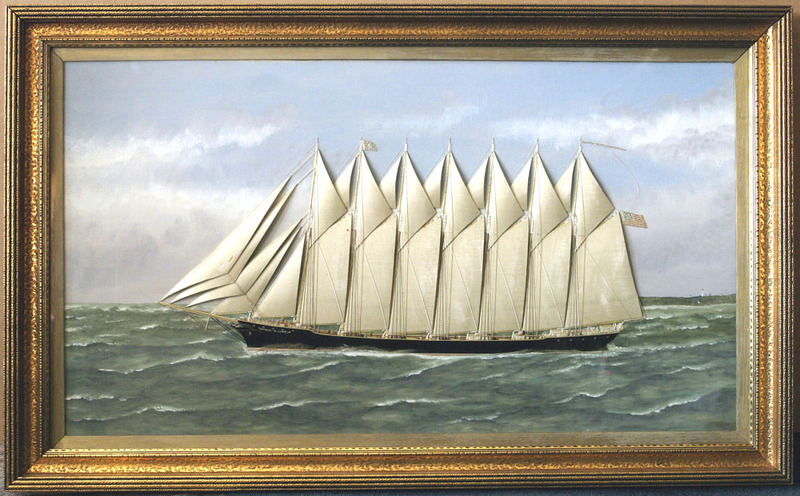 This is an extremely well detailed and rare work by the artist, most likely a commission commemorating her new venture as an oil carrier for the Sun Oil Company which had just signed a 5-year charter for the schooner. 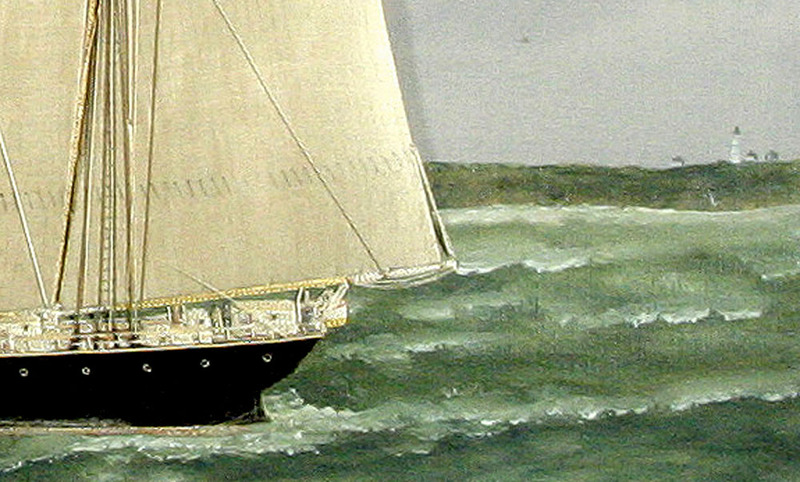 In a most unfortunate first Transatlantic crossing, high seas, her top-heavy design, and possibly the internal tide of the oil cargo moving within caused the THOMAS W. LAWSON to be lost in early December 1907 off the coast of the Sicily Isles. 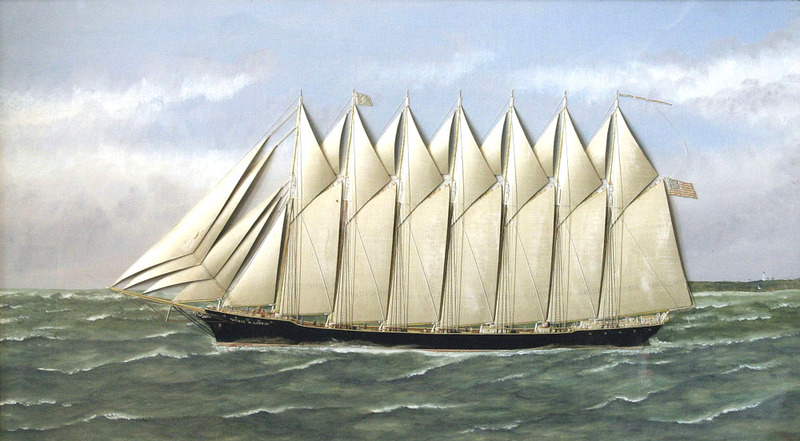 Like her namesake, a noted Boston stock-market entrepreneur and professional gambler who had invested heavily in her construction, the schooner had wagered and lost. Willis captured her striking profile mere months before she was gone. Provenance: William H. Todd, president and founder of Todd Shipyards Corporation, Seattle and New York, 1907-1932; John D. Reilly, second president of the yard, 1932-1953 & Chairman of the Board 1953-1960s, New York City; Mr. & Mrs. Julius Waculik, estate caretakers for Mr. Reilly in New York, circa 1960; by descent in the Waculik Family of New York and Portland, Oregon.